I’m definitely a kitchen lover; it’s my absolute favorite room in the house. And I also adore French style. So putting the two together is absolute perfection to me! 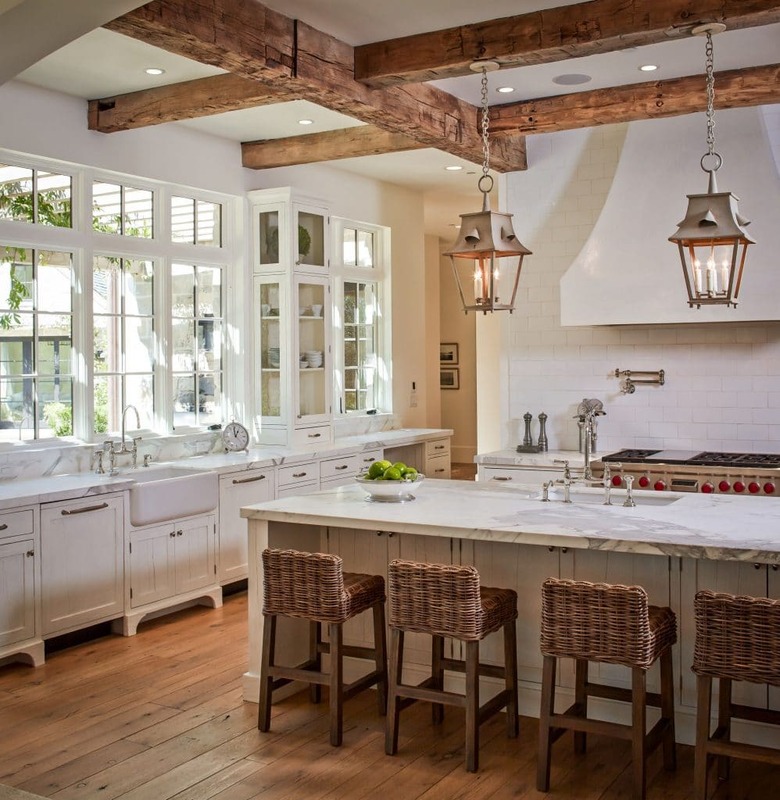 French farmhouse kitchens is a look that I’ve always gravitated to. It’s a little more rustic in style. 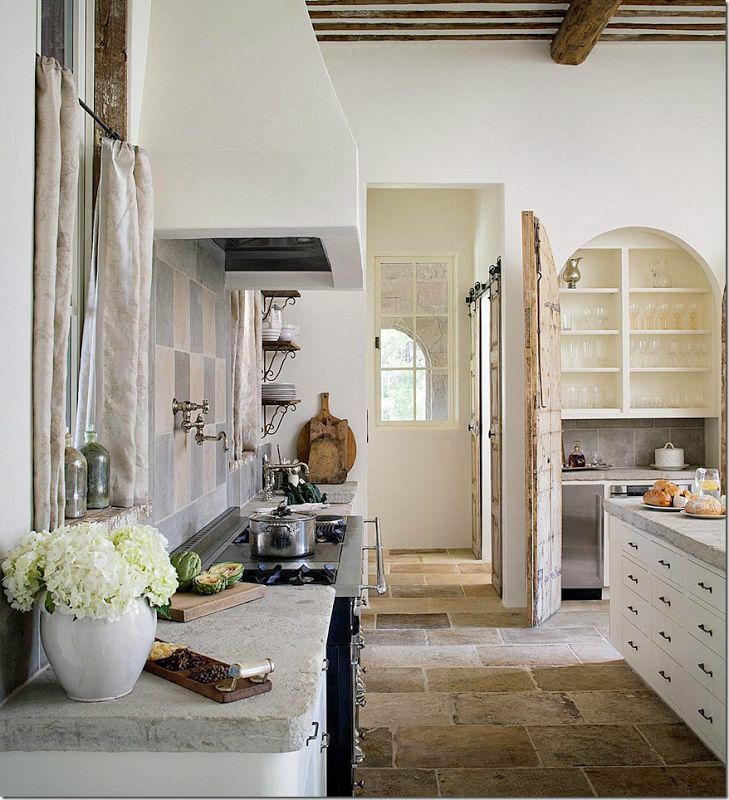 Rather than just echoing “French Country” like mine and many other kitchens do, these either are actual farmhouse kitchens or look like they could be right in the middle of Provence. 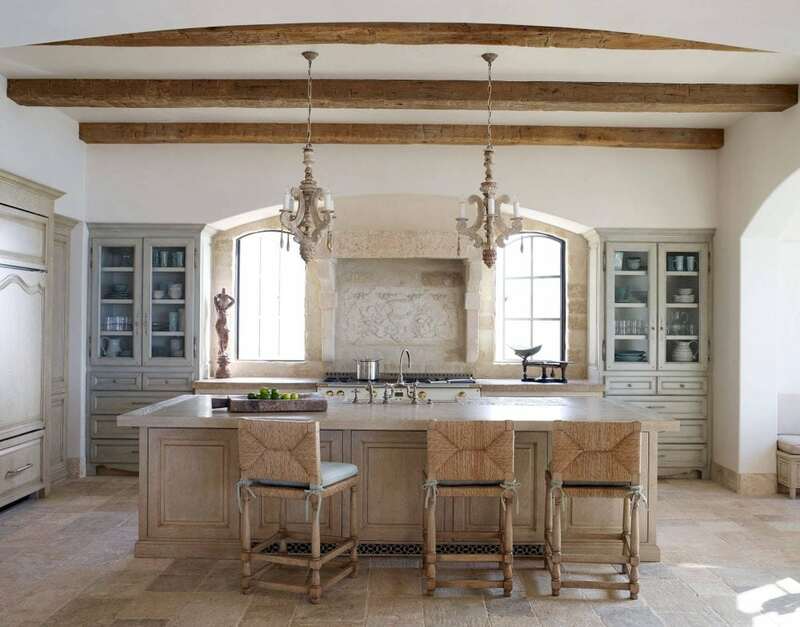 Of course, French farmhouse kitchens do vary but some things they usually have in common is rustic elements such as wood beams, fire-burning ovens, and raw wood. In addition, they often have no upper cabinets and/or mixed and matched cabinets so that the kitchen looks like it’s been created over time. And, they are often not white! I know, I know, I’m going against my “white kitchens only” mantra! But for this level of beauty, I’ll make an exception;) And I’ve noticed if they are white, it’s usually not a stark white but something a little softer. It wouldn’t work here in my suburban house and I feel strongly about decorating true to the architecture you live in, so until I have more property and some kind of farm (French or otherwise! 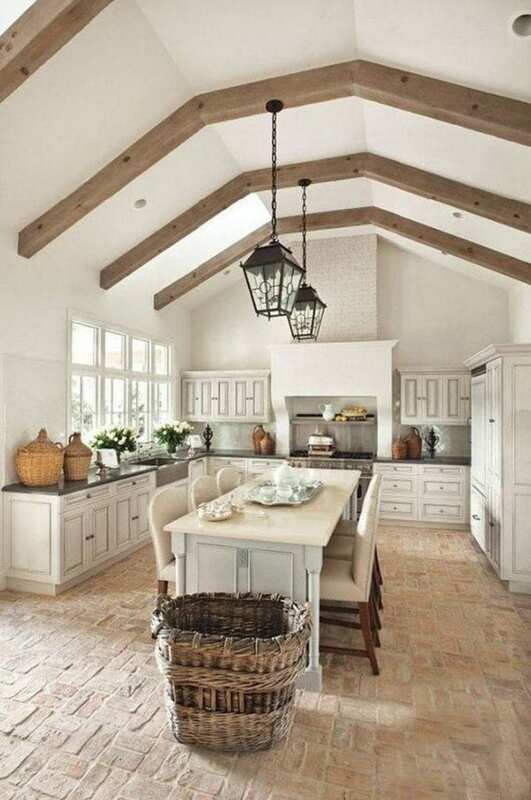 ), a French farmhouse-style kitchen will just have to be something I dream about! And dream is what I’m gonna do….. This is one of my favorites! Those beams and the antique lanterns – swoon! Designed by Thompson Custom Homes via Home Bunch. 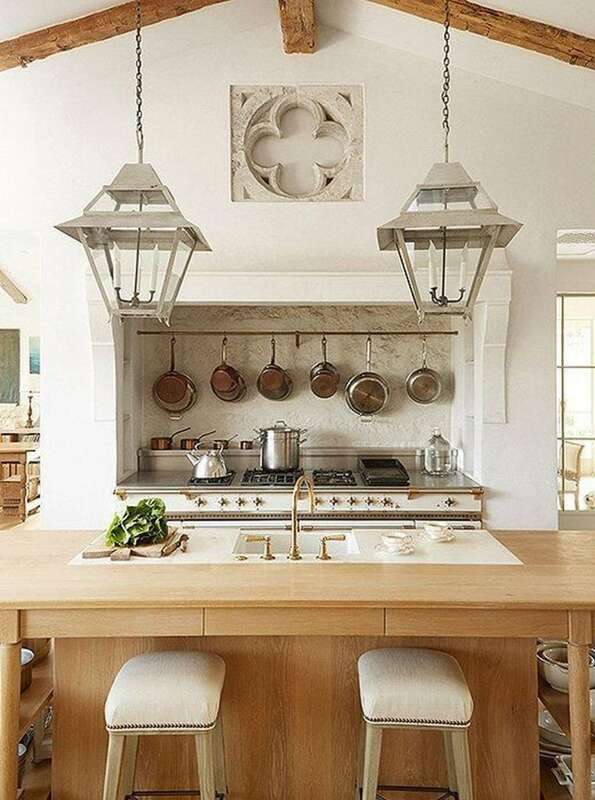 Absolutely one of my favorite kitchens by one of my favorite designers! This stunner is by Brooke Giannetti via Velvet and Linen. 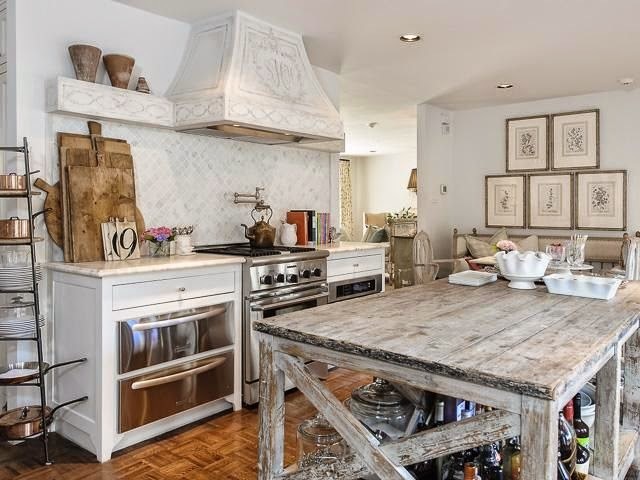 This kitchen has an amazing reclaimed wood island. By another favorite designer, via Lisa Luby Ryan. More gorgeous wood beams. And I adore that grey/green color on the cabinets. Design by Ohara Davies-Gaetano via Veranda. Seriously probably my all-time favorite kitchen. That hood, those antique lanterns, the art casually scattered around. And it’s white too! Perfection! Via House Beautiful. Love the rough stone floors! Via Kevin Harris. 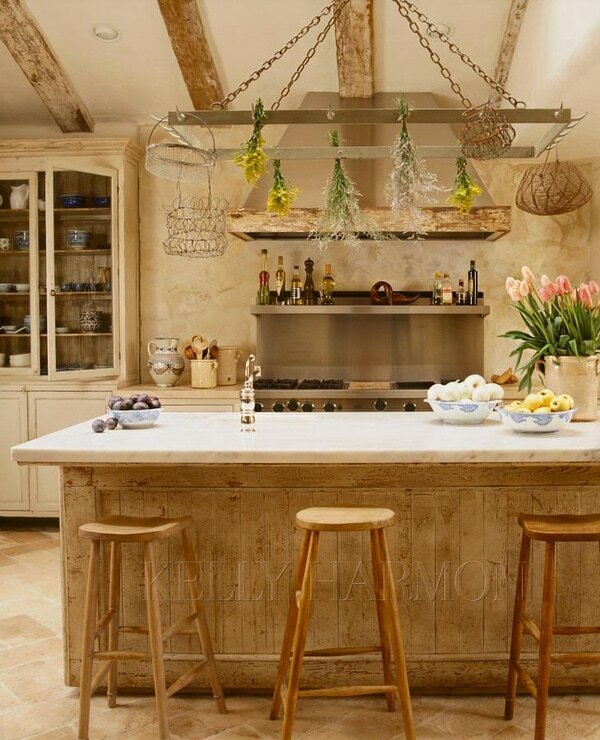 One of my favorite French farmhouse kitchens. Stunning! 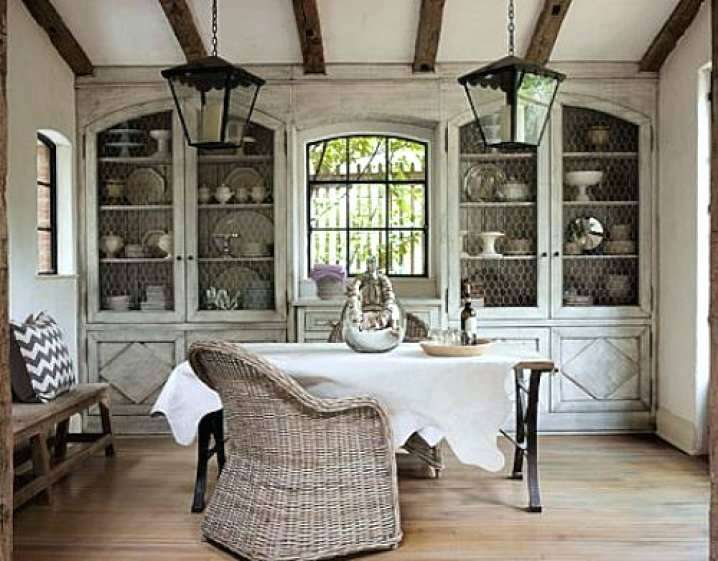 Love the chicken wire in the cupboard doors and that amazing antique lantern. 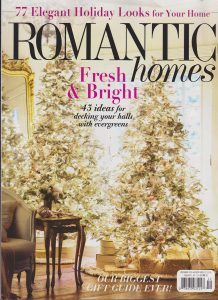 Design by Jill Brinson via House Beautiful. 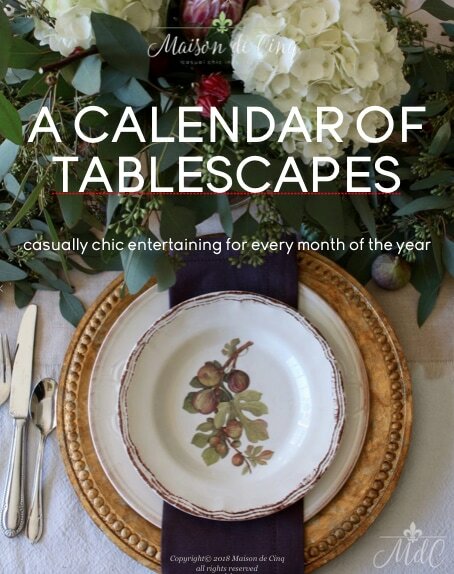 Via Boxwood Home & Interiors. 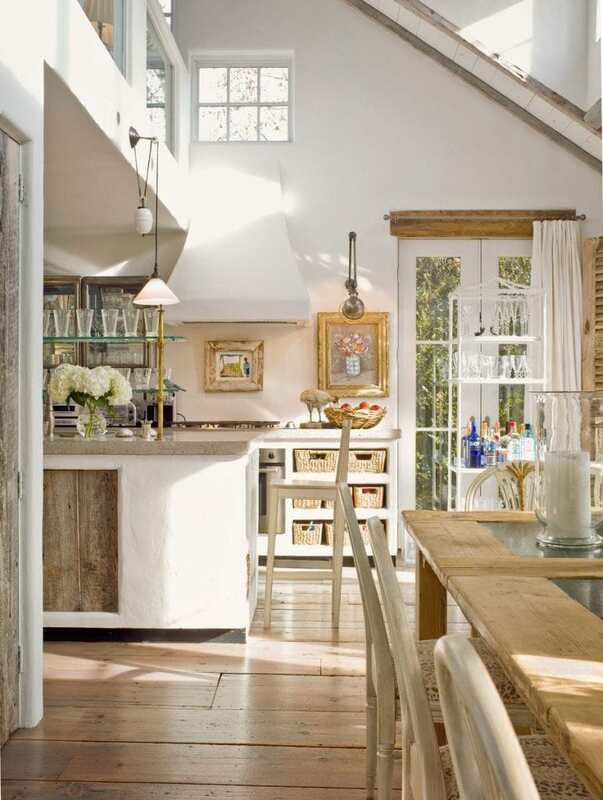 Love all the texture going on here with antique baskets, brick floors, wicker demijohns, and the wood beams. Seriously perfect! Via Dust-Jacket Attic. 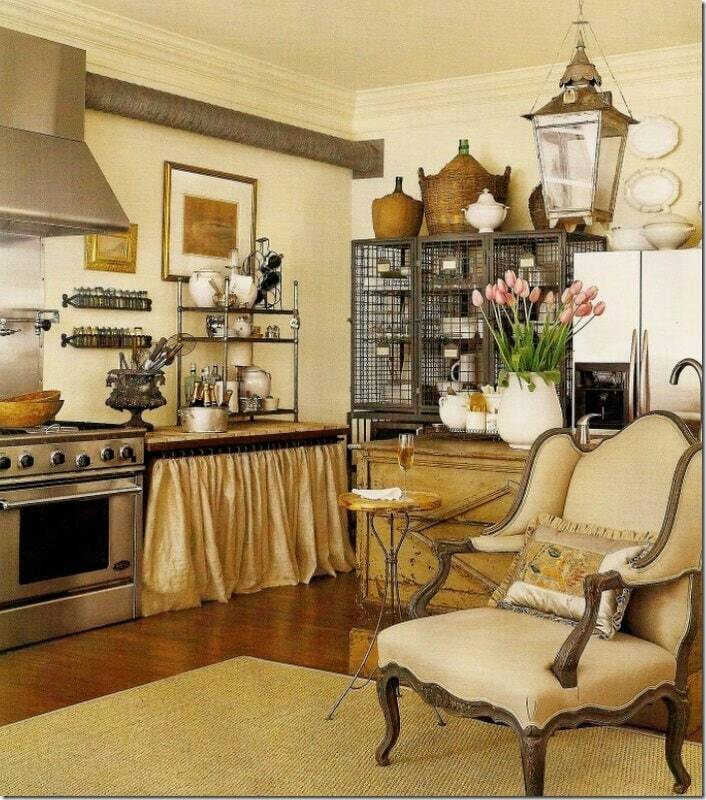 I’ve always loved this kitchen by Jane Moore. So many amazing elements combine to make perhaps the best “non-kitchen” kitchen ever! Via Veranda. This island made of reclaimed wood is stunning. Via Veranda. 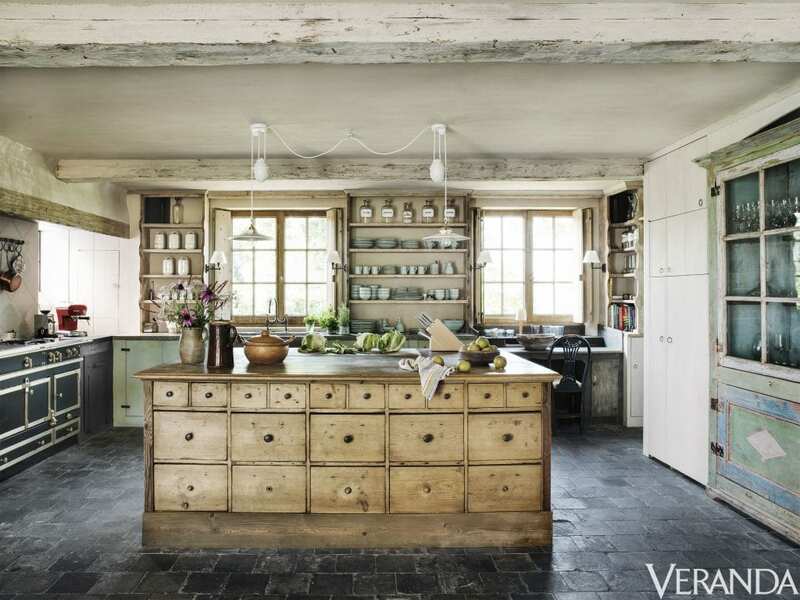 For more kitchen inspiration (including lots of French farmhouse kitchens!) 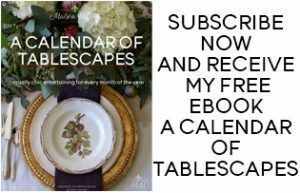 you can visit my Kitchens Pinterest board. I’d love to have you follow me over there too! well I loved all of these! Every time I scrolled down I thought, oh I’ll take that one too! 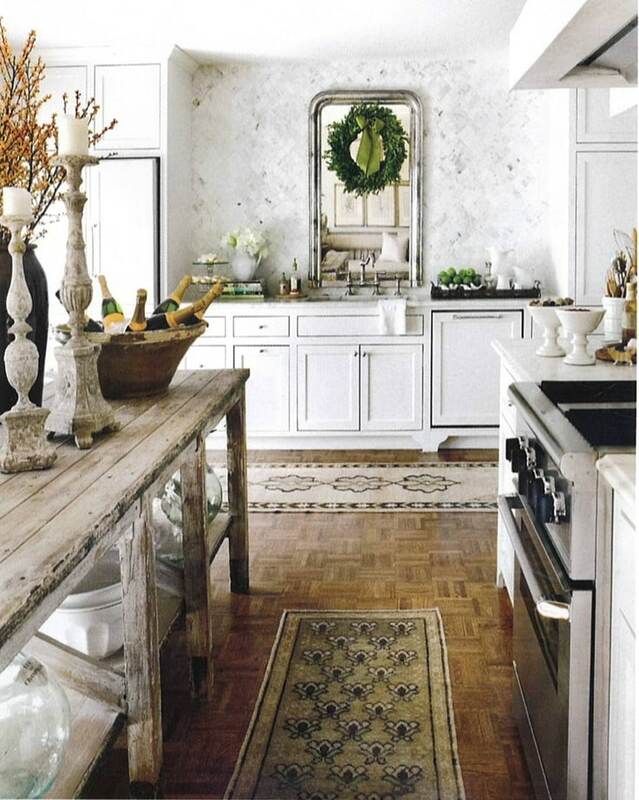 What beautiful farmhouse kitchens! They are just so gorgeous and such inspiration for those of us who love that look! I’m so glad you love them too Karenann! So inspiring!